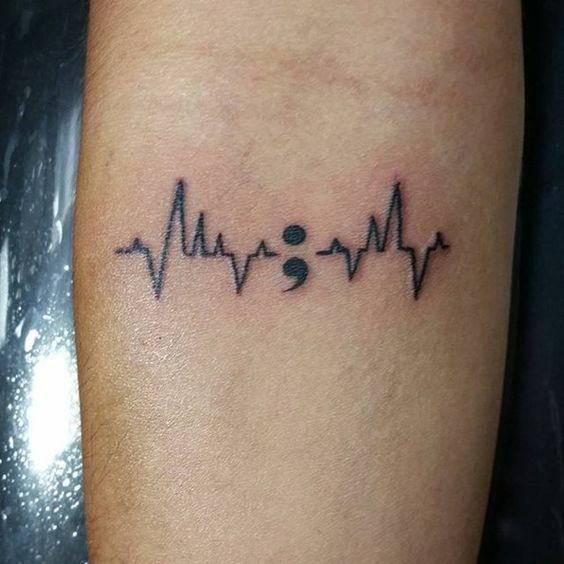 Popularly known as the EKG line tattoo, the pulse symbol is similar to a little monitor with an irregular line that bounces up and down just like when a patient is hooked to a heart monitor. To sustain life, the line should be moving up and down as the opposite means that a person is no longer alive. The heartbeat tattoos for men symbolize that life is precious. It shows off a brilliant combination of emotions and science. This makes it appealing, especially for the gentleman who do not want to go all out, but want something simple with a deep meaning. It looks good regardless of the position where they decide to place it which means that they can show it off anytime anywhere. It can be hidden- for men who do not want others to know that they have a tattoo, they can get a small design of the heartbeat and hide it under clothing where no one can locate the tattoo. The tattoos could mean that a person appreciates renewed life, especially if they have had a near-death experience. For others, it could imply that they are aware the clock is ticking; thus, should live life every day as though it was their last grabbing all opportunities that come by. It is safe to say that he tattoos symbolize love, life, passion, strength, power, persistence, endurance, and the ability to keep forging on regardless of the obstacles behind or ahead. Additionally, the tattoo can also be a sign of the commitment of a man’s love towards their life-partners. A person can opt to have the name of the loved ones tattooed on their bodies as a reminder that they will be in love forever. 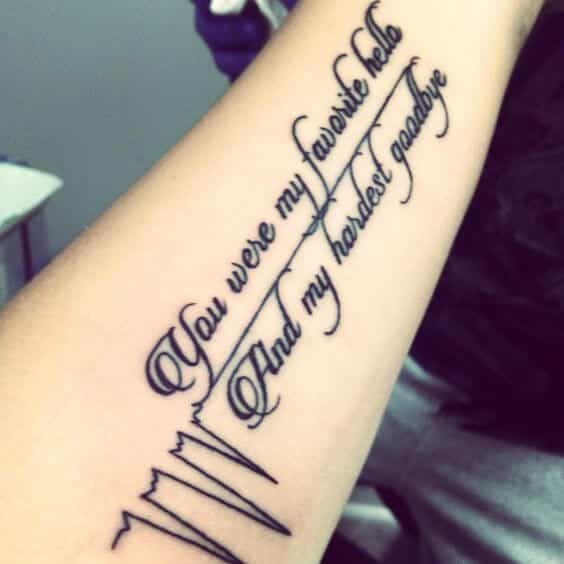 It is also common to see the tattoos feature people who have left earth already to mean that the man who has the tattoo will love the deceased forever and they will never forget them even though they are not alive. Even though it has a simple design, the meanings that are associated with the tattoo can be complicated and personal. The heartbeat tattoos for men can be placed on any part of the body depending on the owner’s preference. However, there are some common places where most people prefer to have them set including the arm, wrist, heart or chest areas. The wrist option is the most popular one where most men prefer to have it around the whole wrist. One can also choose whether they want a small or huge design. 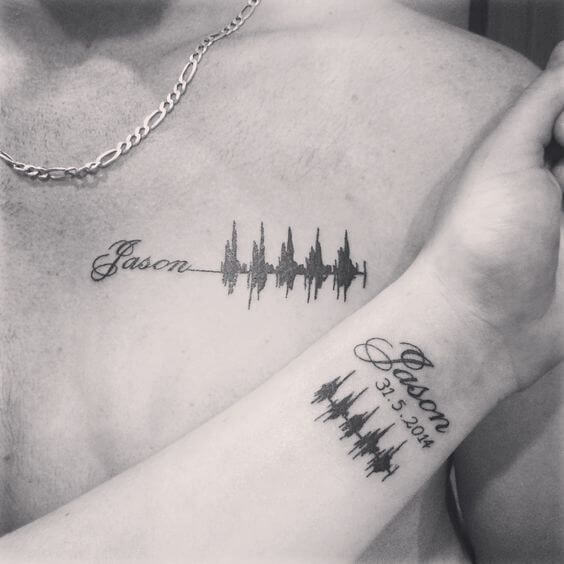 What are the most popular heartbeat tattoo designs available? 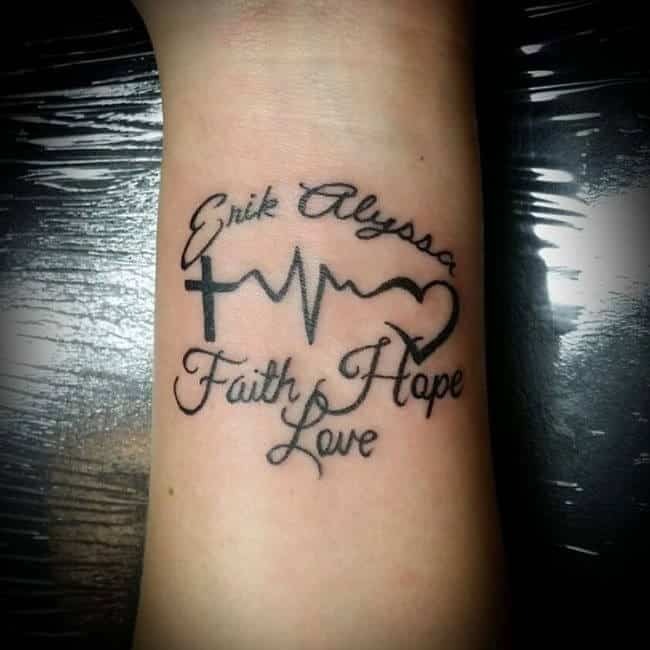 There are different designs of the tattoo where men can opt to add the image of a love heart or even insert the name of a person or thing that they will love to their last heartbeat. Various items can be included in the tattoo to make it more personal. 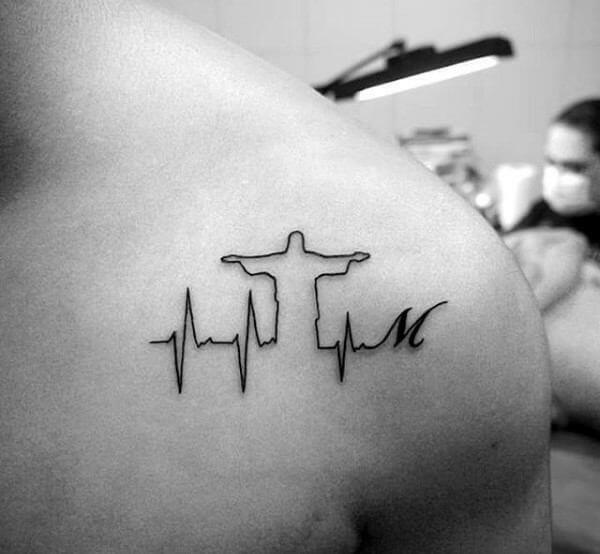 Heartbeat tattoos for men are some of the most meaningful and amazing tattoos around. They do not only appeal to the eyes, but they are also deeply symbolic. Men can get to speak from the heart with such a tattoo without uttering a single word. 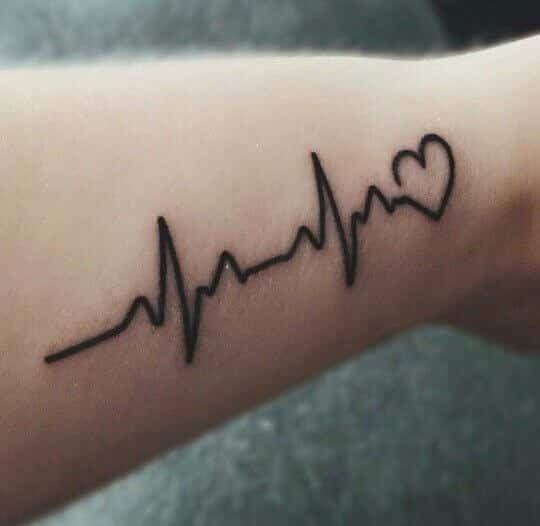 This beautiful heartbeat tattoo, sketched on the forearm in monochrome, immediately grabs the attention on account of its thoughtful and elegant design. The artwork features a lovely depiction of an electrocardiograph which morphs into the shape of a heart on one side, and the word ‘you’ on the other. 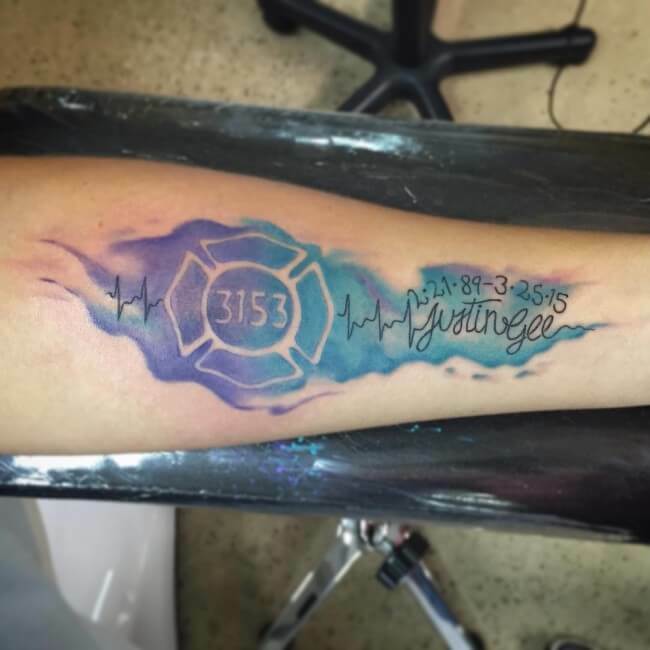 If you have been contemplating heartbeat tattoos, then this artwork is sure to pique your interest. Beautifully etched on the forearm, this lovely artwork in monochrome features the graph of a beating heart that has a cross on one side, and a lovely shape of the heart on the other end. Beneath the graph, the artwork has three lovely words, namely, ‘faith, hope, love’. 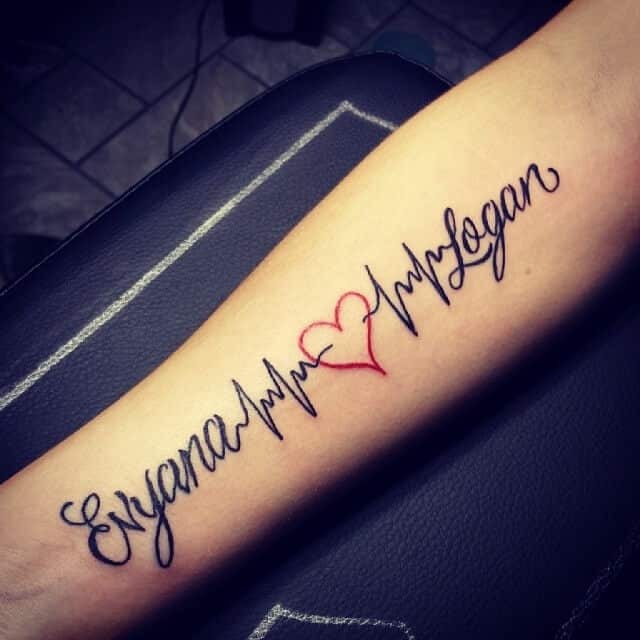 If you have been looking up heartbeat tattoo ideas, then perhaps your search has come to an end. This simple and elegant artwork, etched on the forearm, features a lovely graph of the beating heart. On the farthest side, the graph morphs into the shape of a beautiful little heart. 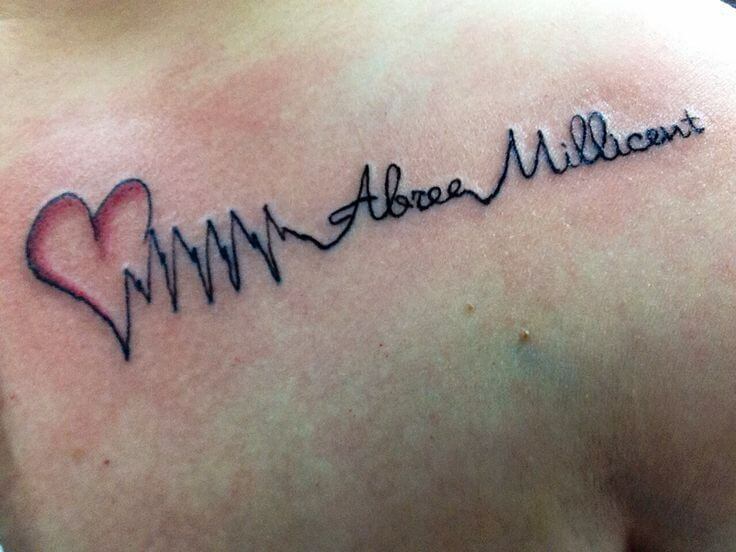 For those who have been looking for truly personalized heartbeat tattoos idea, here is something special. Etched across the upper chest region, this monochrome artwork represents an electrocardiograph with a heart shape on one end, and the name of your loved one on the other side. Those among you who prefer their heartbeat tattoo design large and rich in detail, this artwork is bound to generate plenty of interest. 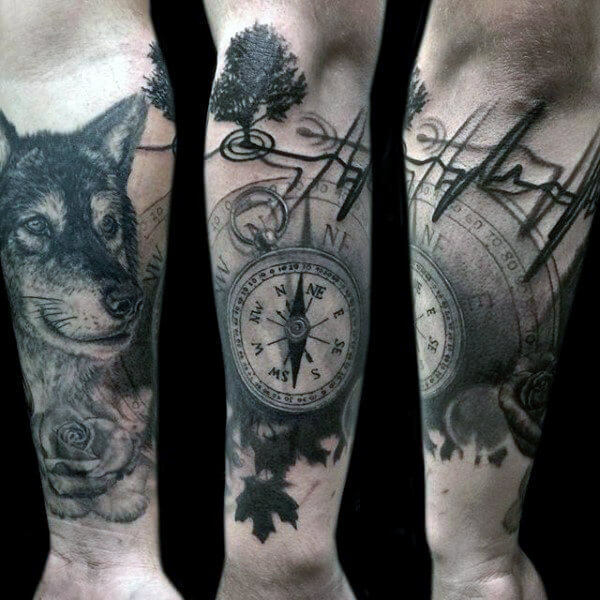 Etched on the forearm, this hauntingly beautiful artwork features a beautiful wolf, a rather stately looking tree, a mariner’s compass, a graph of the beating heart on top. The presence of a rose adds a mysterious appeal to this masterpiece. 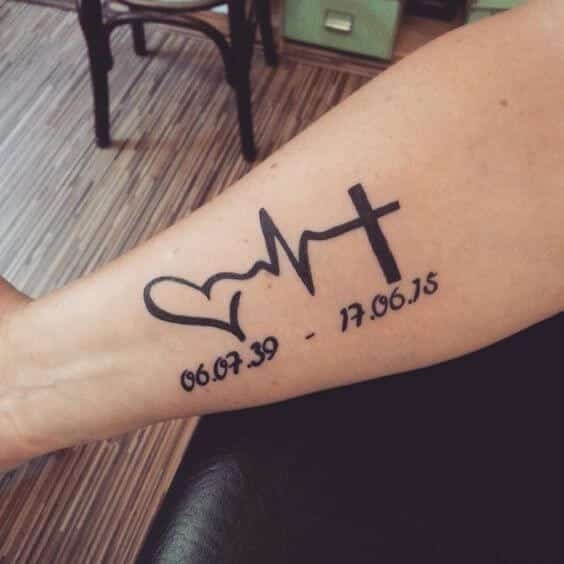 This unobtrusive, simple, and elegant artwork would please many among you searching for perfect heartbeat tattoos for guys. 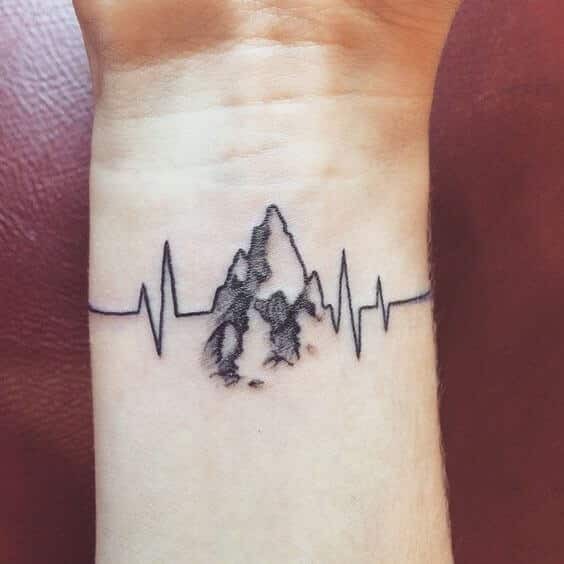 The artwork, etched in monochrome across the wrist, features an elegant graph of the beating heart that morphs into a mountain peak in the middle. 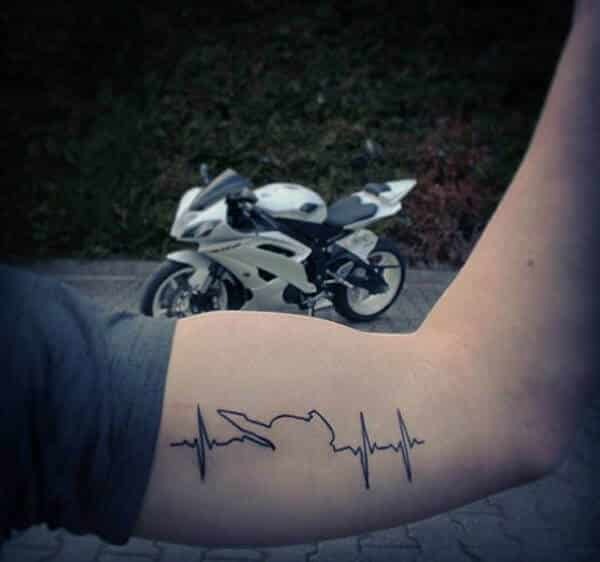 Heartbeat tattoos for men are getting increasingly popular, and this artwork offers a wonderfully personalized design. 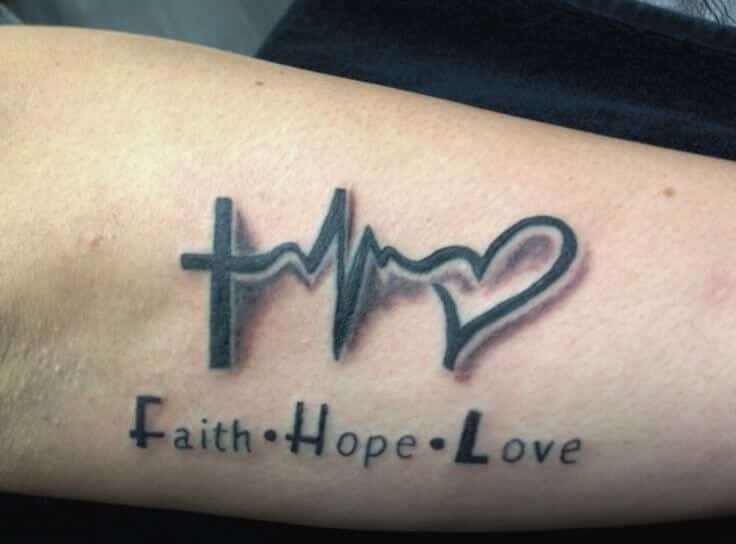 Etched on the forearm, this monochromatic design features a heartbeat graph that takes the shape of a heart on one side and a cross on the other. Beneath, the birth and expiry date of your loved one is mentioned. People who have been researching tattoo ideas for men should pause and think over this lovely artwork. 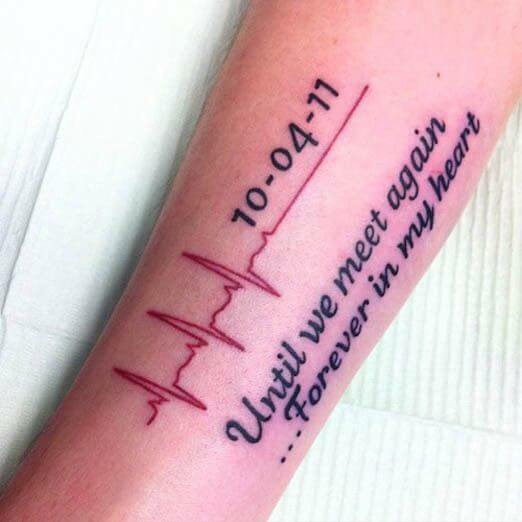 Etched on the forearm, this dual colored artwork features the image of a heartbeat graph that goes flat on one side. The date of the loved one’s expiry date is mentioned on top where the graph goes flat. Beneath the graph is a lovely message that reads, ‘until we meet again, forever in my heart’. If you have been on a hunt for tattoos ideas for long, then this rather small and intimate artwork would engage your interest. 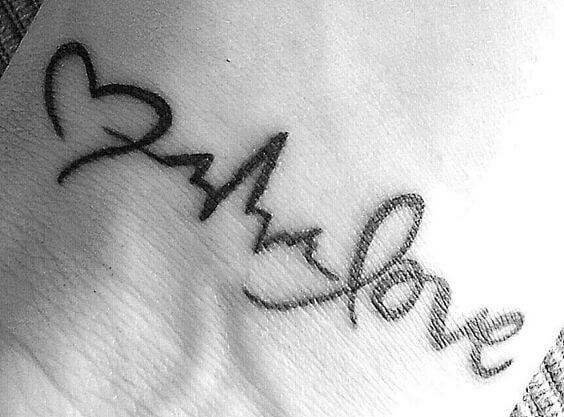 Sketched on the wrist, this charming tattoo features a heartbeat graph that takes the shape of a heart on one side, and the word ‘love’ on the other end. This beautiful tattoo artwork in monochrome is certain to attract a lot of attention. 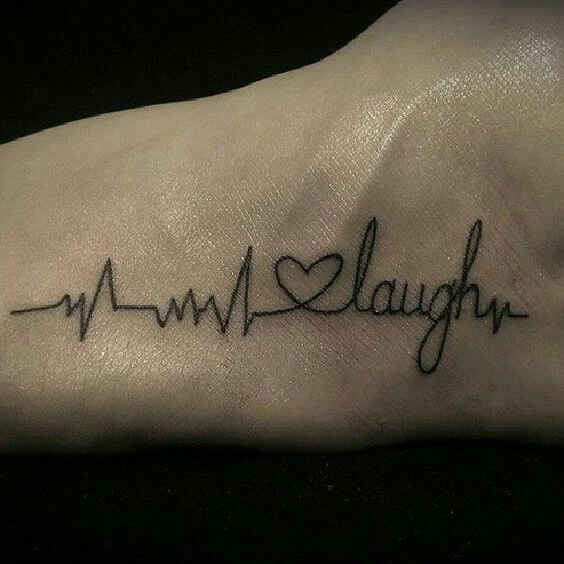 Sketched on the upper arm region, the tattoo features the image of a electrocardiograph that morphs into the shape of a heart in the middle, and ends with the word ‘laugh’ one the other end. 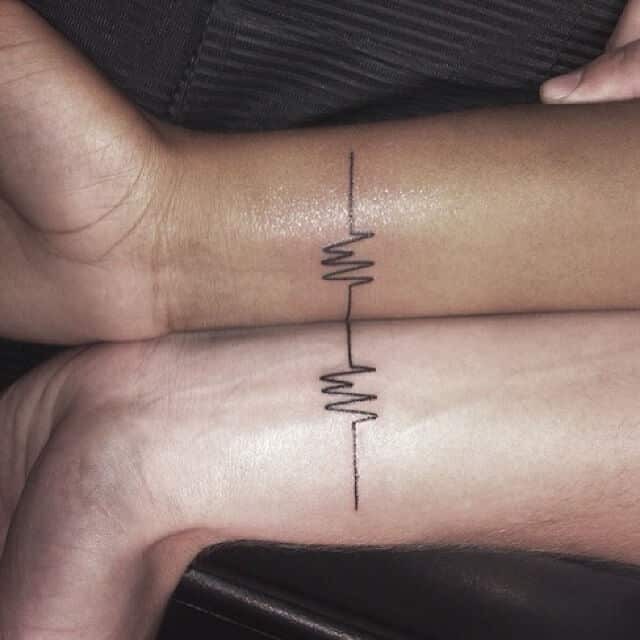 This romantic heartbeat tattoo is truly intimate and adorable. 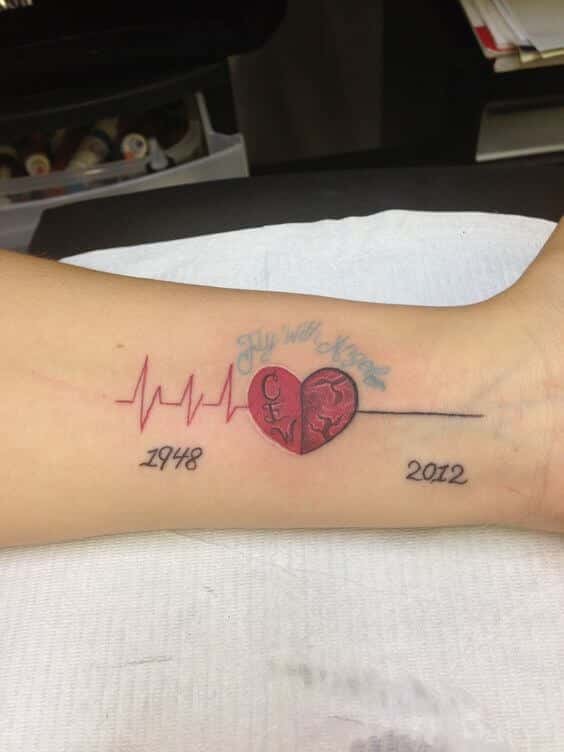 Sketched on the forearm, the multi-chromatic artwork features your name and the name of your loved on either side of a red colored heart, in shape of an electrocardiograph. 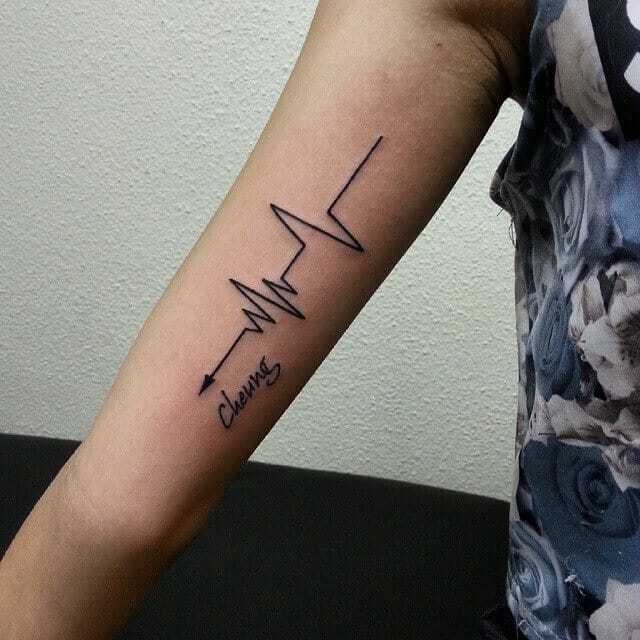 Here is a truly outstanding heartbeat tattoo artwork, both in its concept and execution. This multi-chromatic artwork is sketched across the chest, with the heartbeat graph plotted in a vibrant red color. 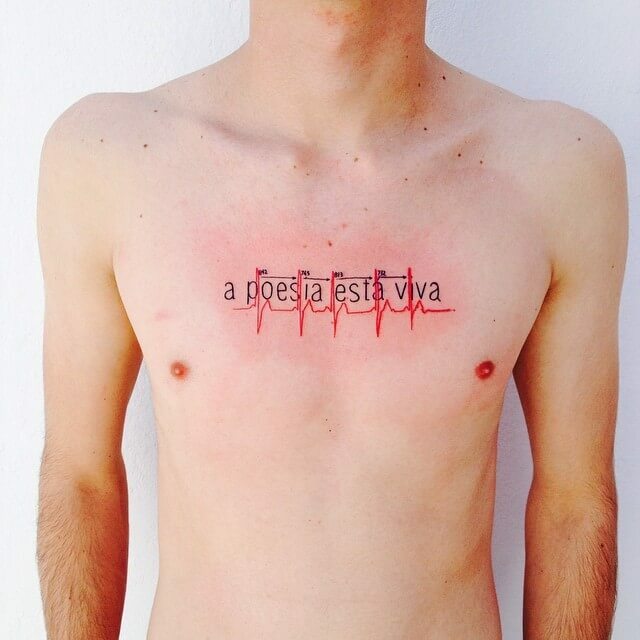 In the background, there is a Latin phrase, namely, ‘a poesia esta viva’. 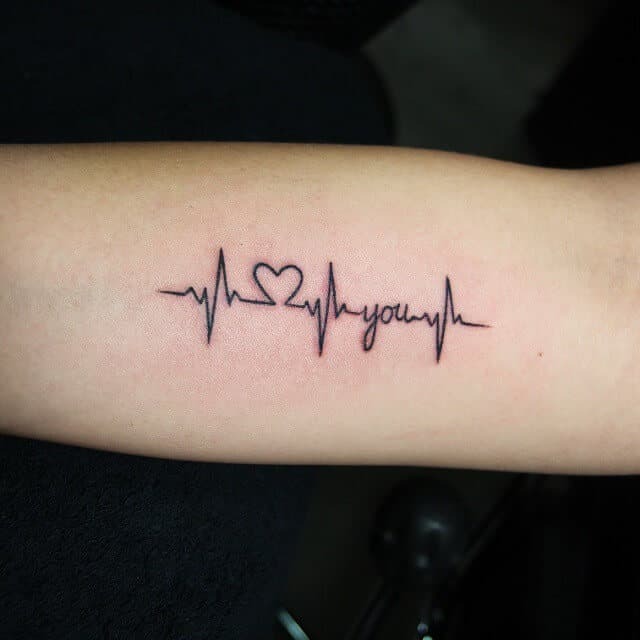 This heartbeat tattoo artwork grabs the attention immediately on account of its intimate nature and creativity. Sketched on the wrist, this small artwork in monochrome features a simple design of the graph of a beating heart. The design on your wrist is only half the tattoo, with your loved one sharing the other half. If you have been looking for an intimate and romantic tattoo artwork then your search ends here. This beautiful artwork in monochrome, etched on the wrist, features the graph of a beating heart that takes the shape of a cross on one side and a heart on the other end. On top, the name of your loved one is mentioned. Beneath, you’d find the words, ‘Faith’, ‘love’, and ‘hope’. This unique and colorful design would get you a lot of attention. Sketched on the forearm, this outstanding multi-chromatic artwork features a splash of colors as the background on one side. On top, the tattoo features a lovely graph of a beating heart that takes the shape of a heart on end. For people who care deeply about their family and want to express it, this artwork is the perfect answer. The monochrome design features the shape of a heart on one side with the graph of a beating heart branching out. 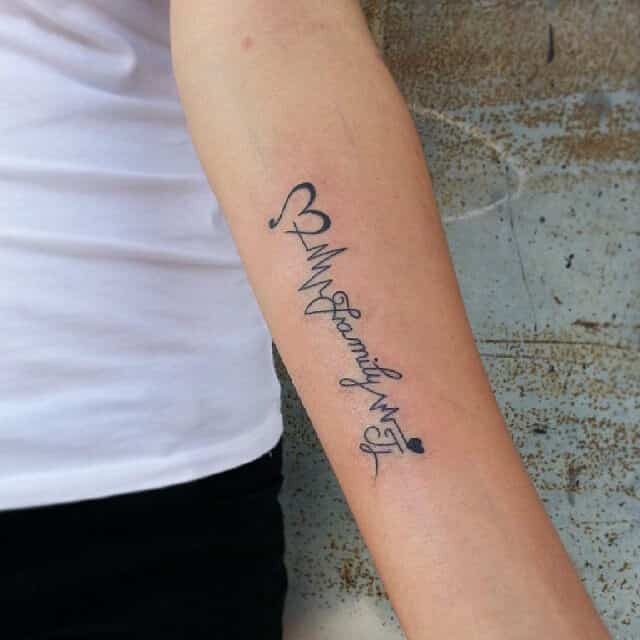 The words ‘my family’ is scrawled here with your initials and another heart shaped design on the other side. This stand out tattoo artwork feature neat and straight lines, offering something truly different. Sketched on the upper arm region, the tattoo features the graph of a beating hard in straight lines, with one end pointing downwards. Your name is etched right below. This monochrome artwork brings a truly unique concept that is bound to generate interest. The artwork, on the upper chest region, features the name of your loved one in cursive that branches out into a graph of a beating heart. Another part of this artwork is sketched on the wrist along with their date of birth. 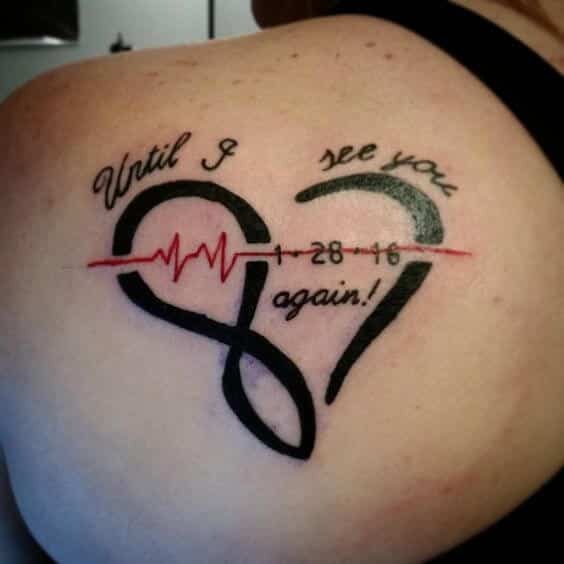 This rather haunting heartbeat tattoo artwork, in monochrome, would interest many among you who want to memorialize your departed loved ones. Featuring the graph of a beating heart that goes flat, it has the message ‘you were my favorite hello, and my hardest goodbye’ scrawled above and below the flat line. This evocative artwork, in dual color, is sketched on the upper back region. It features the graph of a beating heart that goes flat, striking out the date of their departure. It also features a beautiful message, ‘until I see you again’ around the numerals that represent their age. 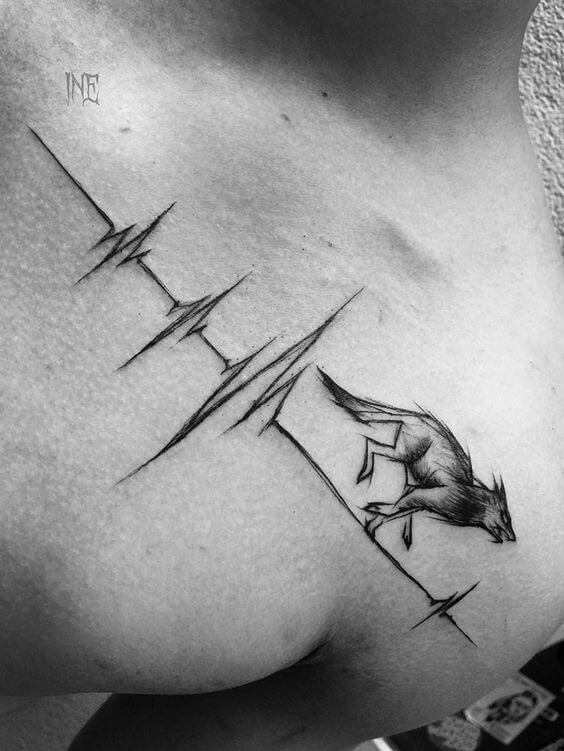 This heartbeat tattoo artwork is meant for those who prefer it wild. 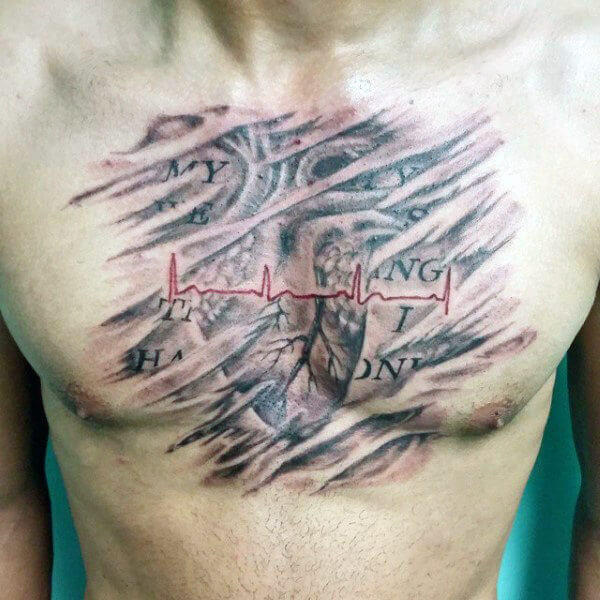 Sketched on the upper chest region, this monochrome artwork features a beautiful graph of the beating heart. The image of a fierce looking wolf on the run adds a stunning appeal to this artwork. 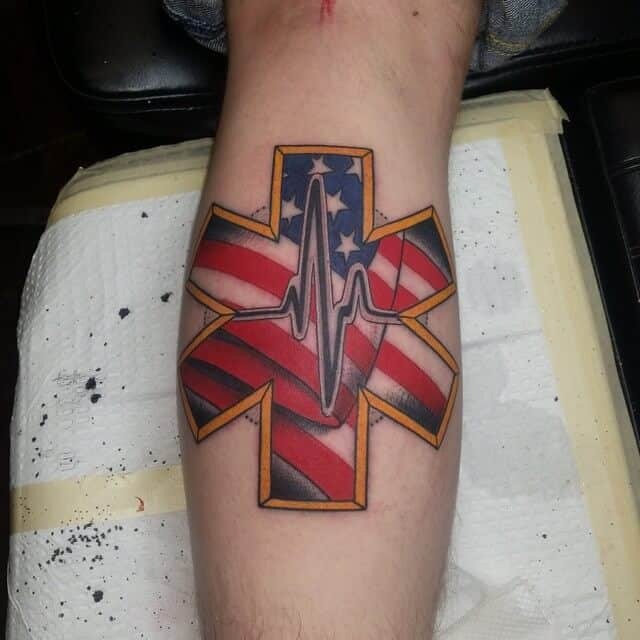 Here is an eclectic heartbeat tattoo artwork that would interest many among you. 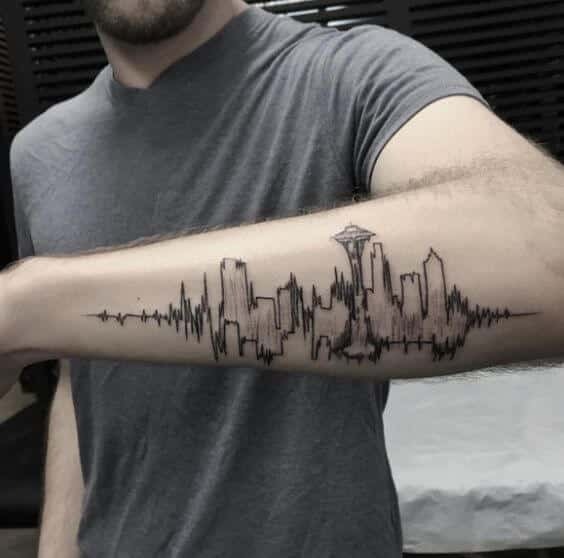 Sketched in monochrome on the upper arm region, the design features an electrocardiograph that takes the shape of skyscrapers in a city. It truly captures the heartbeat of a city life. 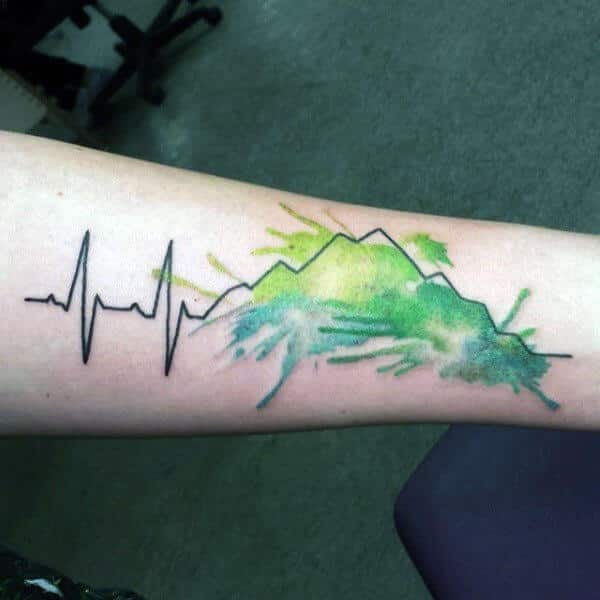 This monochromatic artwork, sketched on the upper arm region, features an electrocardiograph that morphs into mountain peaks on one side. The text ‘in time, I will meet you there’ etched below adds a truly haunting and sombre quality to the tattoo. This tattoo would interest those who prefer it large with a rich detail. This multi-chromatic artwork, sketches across the chest, features the design of an actual heart that is crossed by diagonal streaks. On top is the shape of an electrocardiograph, while the letters inscribed in background add to the richness of this design. This is a large and richly detailed artwork in monochrome. 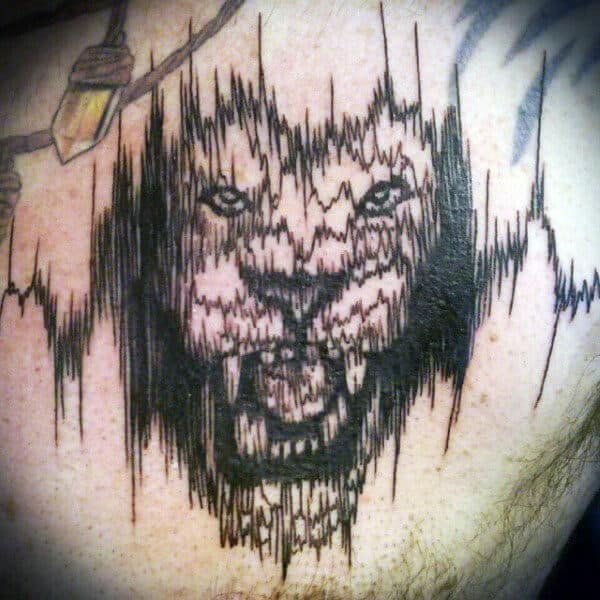 Sketched across the chest, it features an electrocardiograph that takes the shape of a lion, alluding to the ‘lionheart’ theme. The stripes drawn on the shoulder add to the appeal of this tattoo. This design shows a music line in black shades and tones that becomes a real life size heart and is joined at the aorta. 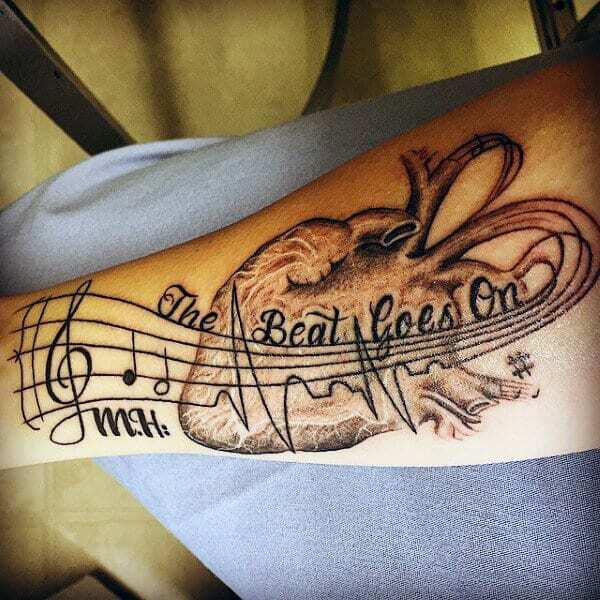 It has great textures that make the heart look real and in the foreground where the music line is shown we have the words “the beat goes on”. 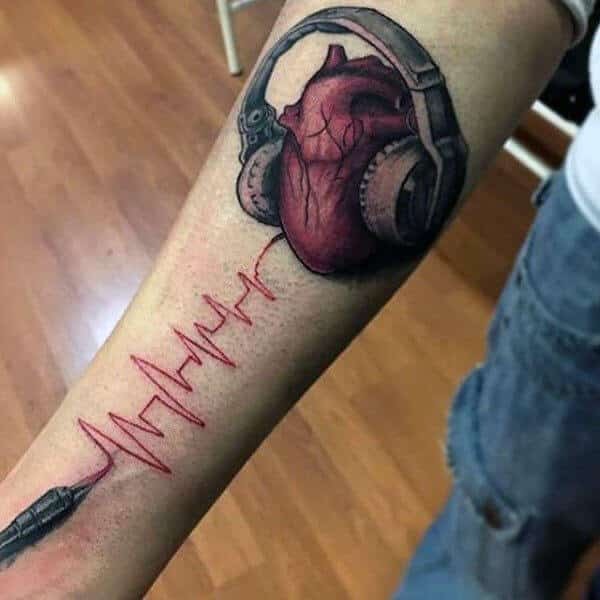 This heartbeat tattoo design is of a real life heart in its towns of red wearing cool black headphones and a red heartbeat line is drawn on by a black tool which shows the end of the tattoo. 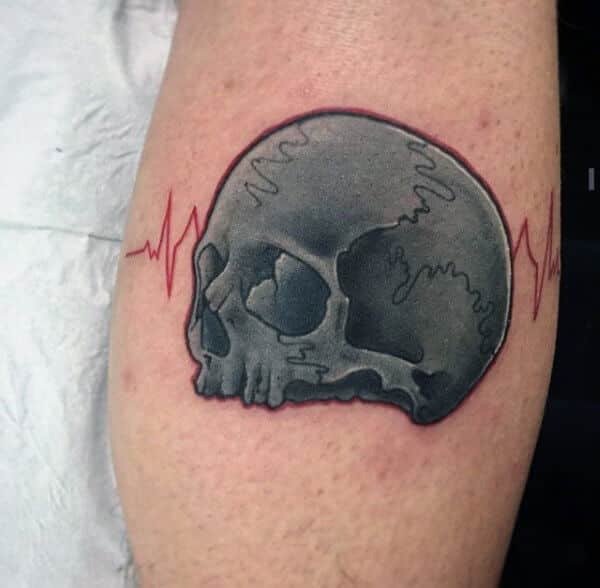 This heartbeat tattoo design for men has a red heartbeat line in the background and half of a skull in grey shades in the centre. The skull is turned towards the right hand side so that you can only see one third of the right hand side of the skull. This symmetrical design is of a six star like shape of the American flag. The star like shape has a yellow outline and a black heartbeat line in the centre of the American flag with a slight white outline. In the background, slightly seen is a grey circle that has a dotted outline. 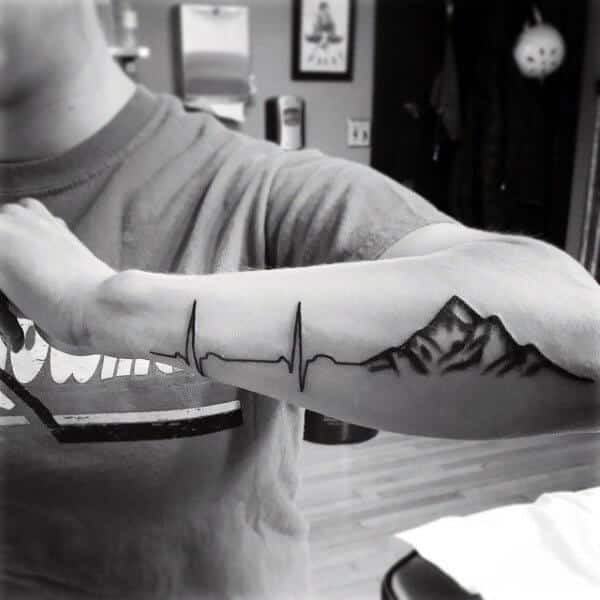 This simple black shaded heartbeat tattoo shows a heartbeat line that turns into a strong black shaded mountain with lots of textures as we see in real life mountains. 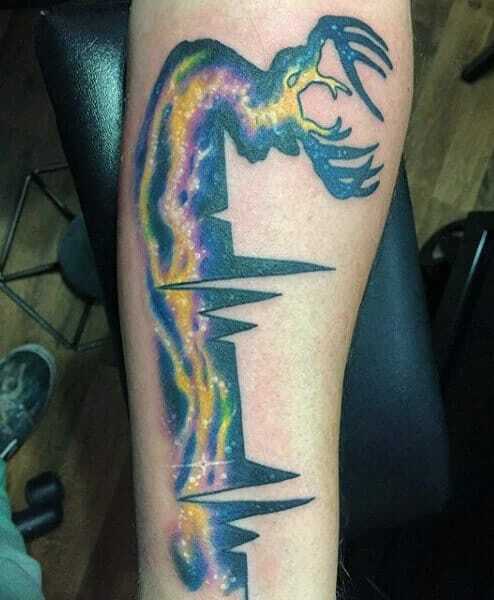 This heartbeat tattoo for guys has different shades of green, yellow, pink, blue and orange show a half coloured heartbeat line with an abstract deer like shape with big horns coming from under the heartbeat line through to the left side of the tattoo. 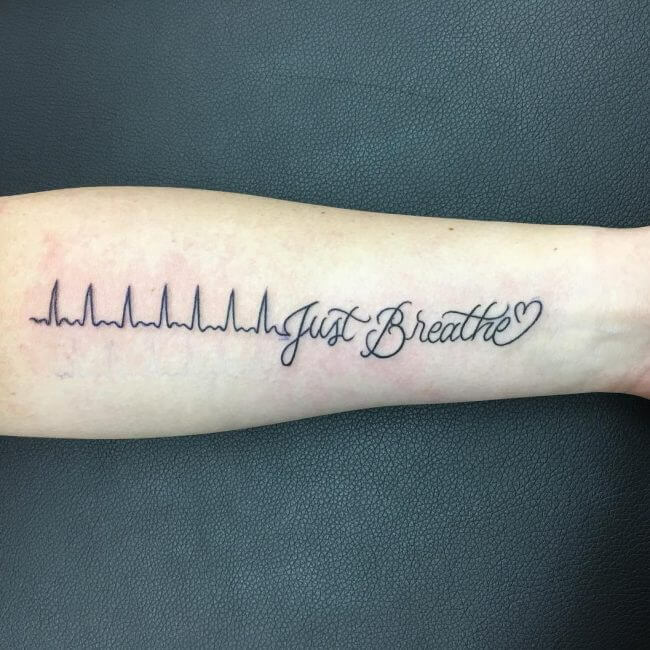 Our simple but clear black tattoo design which starts with the beginning of a heartbeat line and once it gets half way we are shown the words “Just Breath” which turns in to a little drawn heart at the top end. 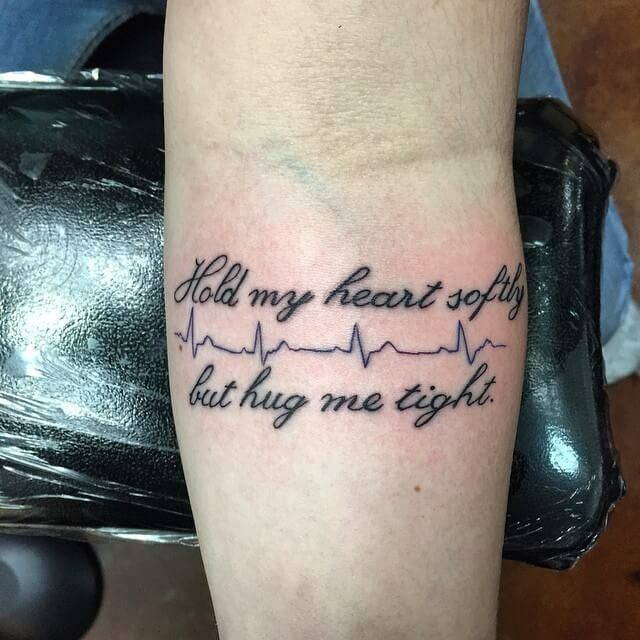 An expressive heartbeat design for guys in black shades with a clear hand written message of “hold my heart softly” and “but hug me tight” and a heartbeat line in between the two writings. 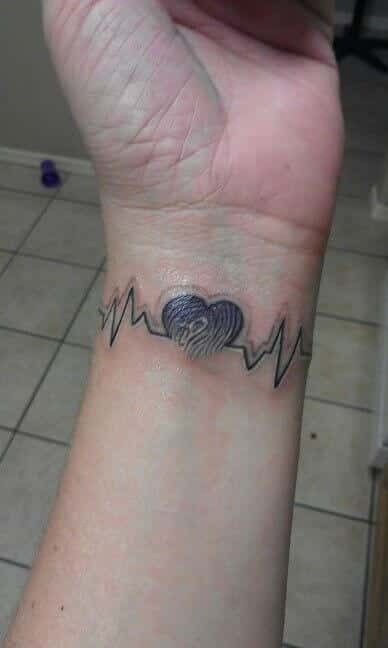 This black heartbeat tattoos idea also represents a heart, it is of an asymmetrical heartbeat line that is separated in half with a dot coma clear symbol right in the middle. 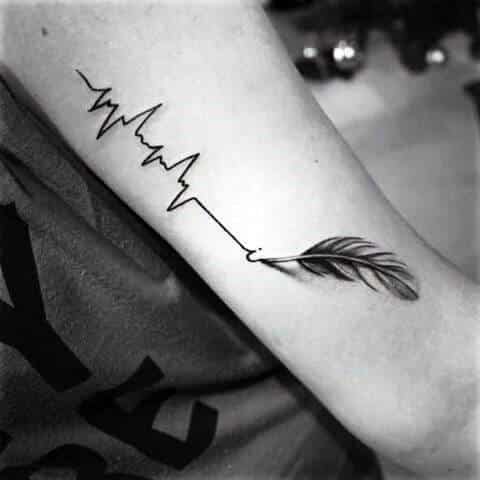 This tattoo is a black heartbeat line drawn as if it was written with a feather and on the right hand side we have the tool – a beautiful detailed feather that represents the tool used to draw this heartbeat line. 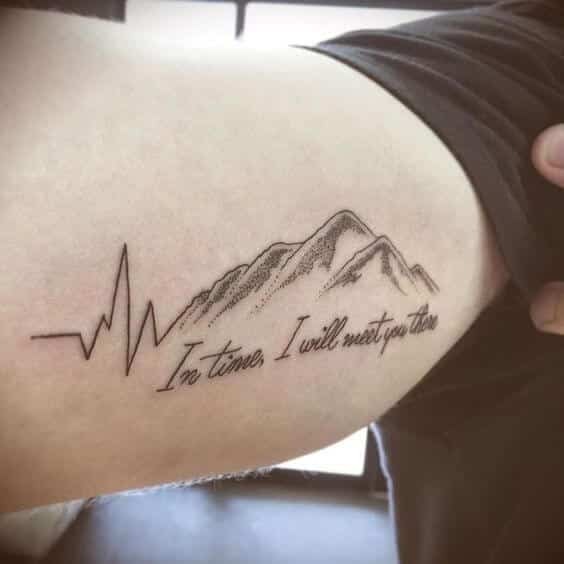 This heartbeat tattoo ideas uses a black heartbeat line beginning at one end that turns into an outline of a mountain. This mountain contains shades of green and yellow colours in forms of a splash, as if they were splash painted. We are shown a black detailed heart with a band around it and the words “heart beat” but the letter “a” is in the form on a red heartbeat line and so is the background on the band. This band continues on and is seen also behind the heart and there are a couple of leafs drawn under the heart. Shades of purple and aqua represent the background of this heartbeat tattoos as if they were water painted. We begin with a black heartbeat line which immediately is broken by a circular skin coloured shape and the numbers “3153”. The tattoo then continues with the heartbeat and a signature “Justin..” and a ten digit number above it. 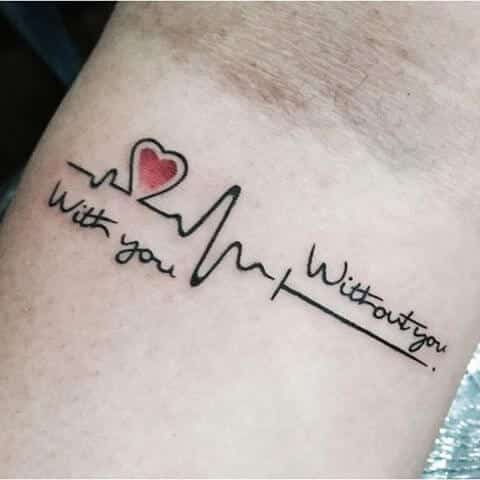 This tattoo ideas for men begins with a black heartbeat line that produces a love heart which is painted red and below it the words “with you”. Then it continues onto a straight and no heartbeat line with the words “without you” above it. 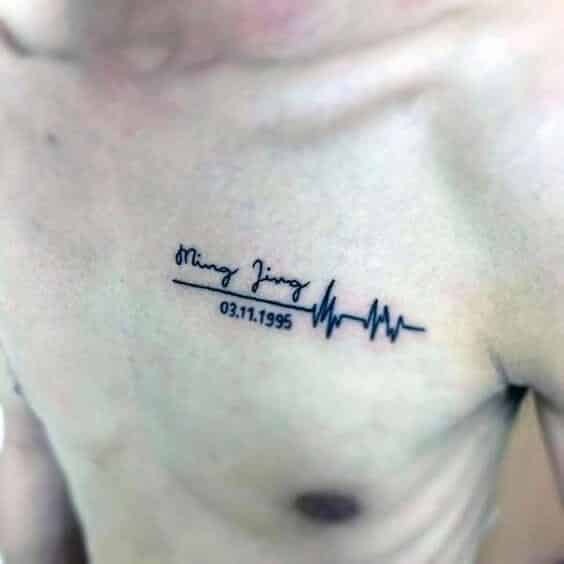 A black heartbeat line tattoo ideas beginning with no heartbeat and the name “Ming Jing” above it and a date “03.11.1995” below it and continues to become a normal working heartbeat line. 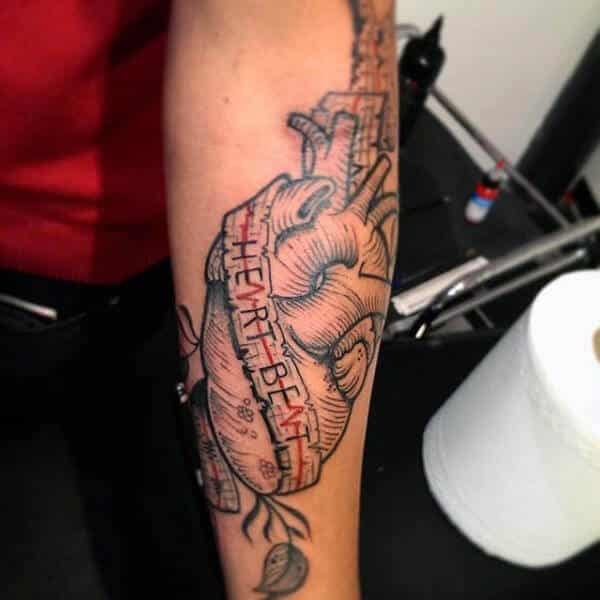 A bright red heartbeat tattoo design with roman numbers and letters separated by dots in capitals in clear black ink and all throughout the red heartbeat line. 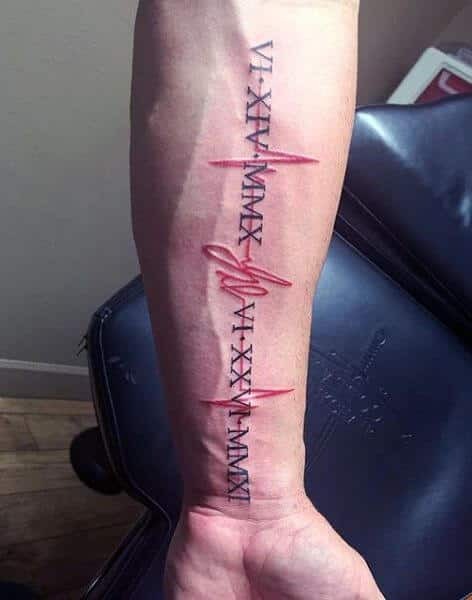 It reads “VI.XIV.MMX” with a space and “VI.XXVI.MMXI”. 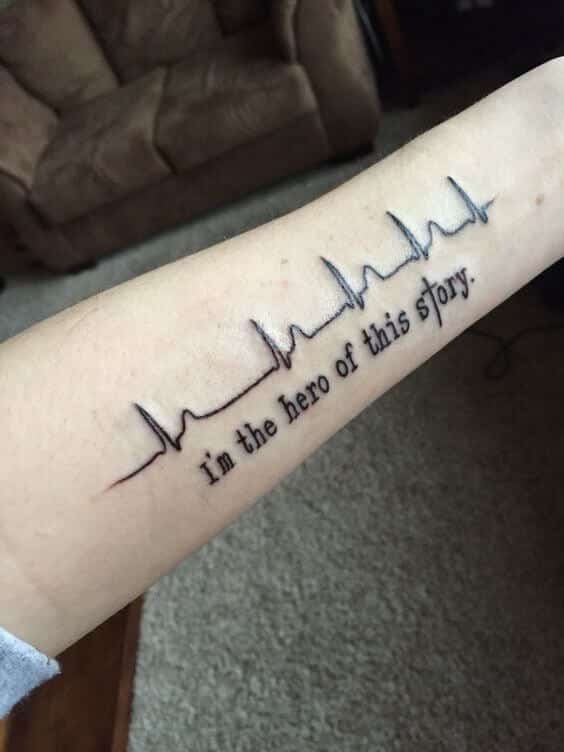 This heartbeat tattoo for men has the design of a long heartbeat line in black ink and below the heartbeat line the words “I’m the hero of this story” are also hand written in black ink shades. 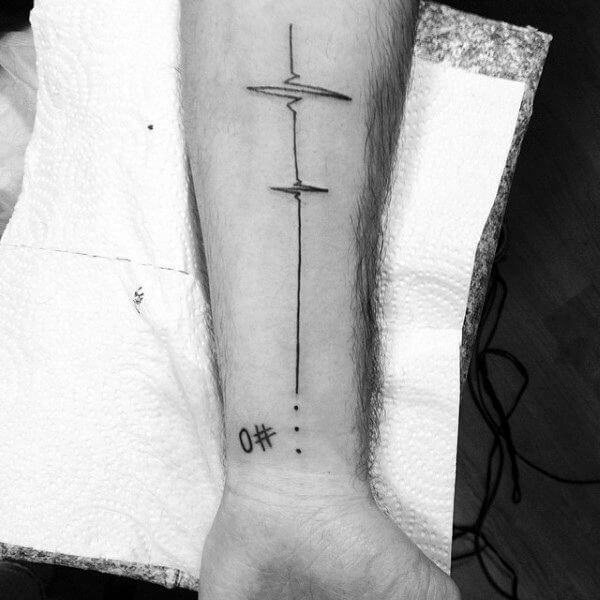 This tattoo design idea represents a heartbeat line in black ink which ends or starts with three dot points after the heartbeat line ends and the number and symbol “0#” next to these dot points. 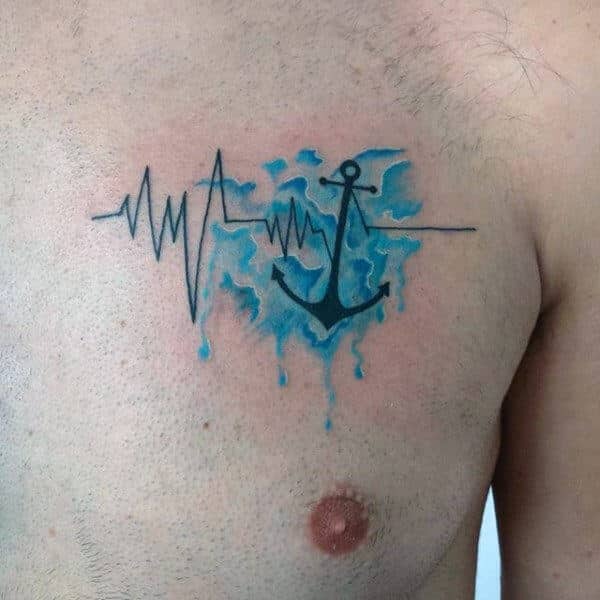 A smaller sized men´s tattoo with a heartbeat line drawn in black ink that becomes a ship anchor and in the most part of the background we have the sea represented in clear blue shades. 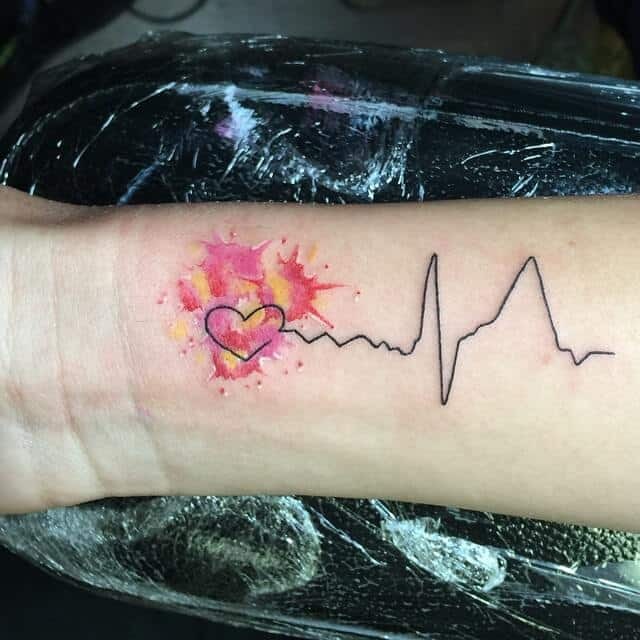 This heartbeat tattoo idea has a clear black heartbeat line which is slightly shaded on the top half on the tattoo and in the middle of the heartbeat we are shown a love heart textured shape with a tone of blue ink. This tattoo design for men represents a heartbeat line in red ink that joins into a red love shape heart with the letters “CEW” in the centre. The other side of the red heart is drawn broken with a black outline which continues to become a straight heartbeat line. Under the heart on separate corners we have the years “1948”and “2012” above the heart in baby blue hand writing “Fly with Angels”. This heartbeat design idea for men was designed to have a simple option available for our clients. It is a heartbeat line in black ink which begins with no heartbeat and continues with a strong heartbeat. This black design begins at one side where there is a heartbeat and in the middle of this heartbeat we have an outline of a human figure in a cape from the back view with arms spread wide. After this, we have the heartbeat line continues and ended with a bold hand written letter “M”. 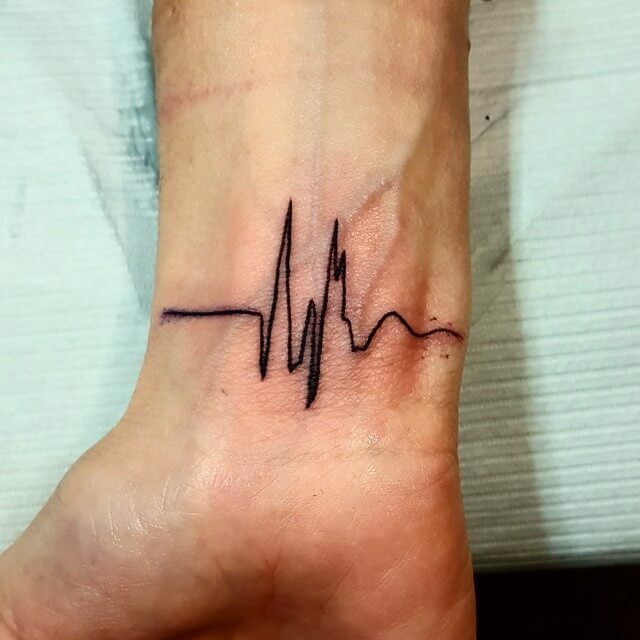 This heartbeat tattoo design for men is a simple ongoing heartbeat line with an abstract outer layer shape right in the middle of the heartbeat line and it is all drawn in black ink shades. 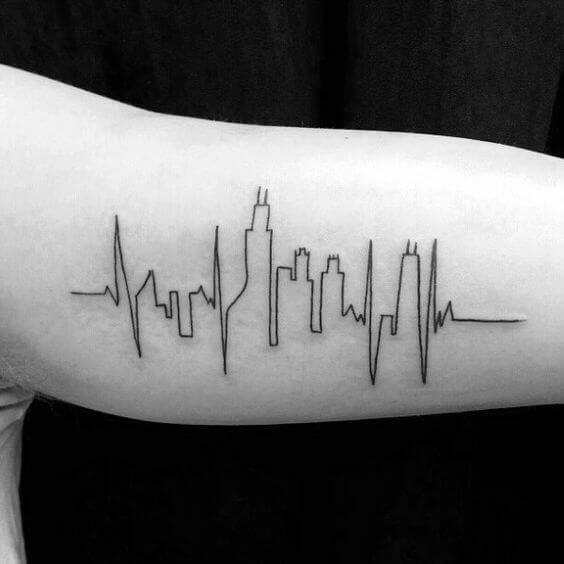 This heartbeat detailed black shade tattoo design represents a long heartbeat that turns into the shapes of a city which are shown in the centre of the tattoo. We are shown city towers in a simple yet clear way with some shading of grey and black tones.